Here’s a general rule about hockey fans: They hate just about everyone. 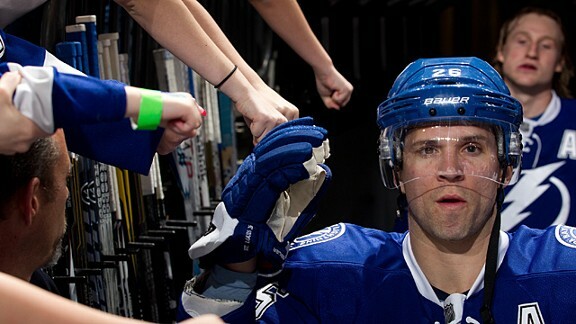 If you’re an NHL player, it doesn’t take much for hockey fans to turn against you. Sidney Crosby? Too whiny. The Sedins? The whole twin thing is creepy. Alexander Ovechkin? Once he scored a goal and then looked happy about it, so screw that guy. Basically, if a player has ever signed a big contract or won a fight or expressed an opinion, some large bloc of fans have already added him to their enemies list. But every once in a while, a player manages to stick-handle through the neutral zone trap of hockey hatred and break in alone on the goaltender of positivity and — holy crap, that was a terrible metaphor, but I’m leaving it in because you get the point. Anyway, here are a dozen of the NHL’s most universally admired active players, the reasons we love them, and a suggestion for why we should all just turn against them now and get it over with. 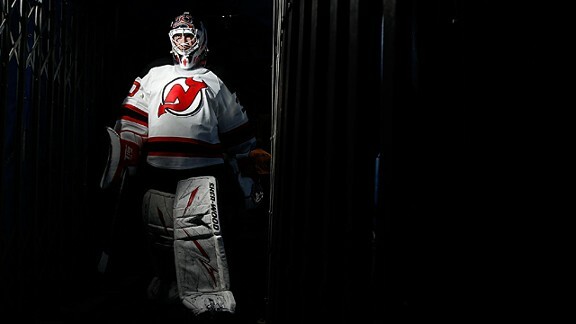 Brodeur owns three Stanley Cup rings and two Olympic gold medals, and pretty much every goaltending record there is. 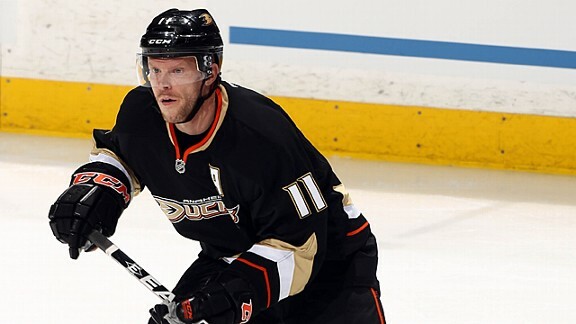 He and Sean Avery hate each other, and do you really want to be on Team Avery for anything? He spent most of his career being compared to and contrasted with Patrick Roy, and that guy was kind of a spaz. If he would’ve just stopped one clumsy wraparound attempt, we could all still be chanting “1940” at sobbing Rangers fans. 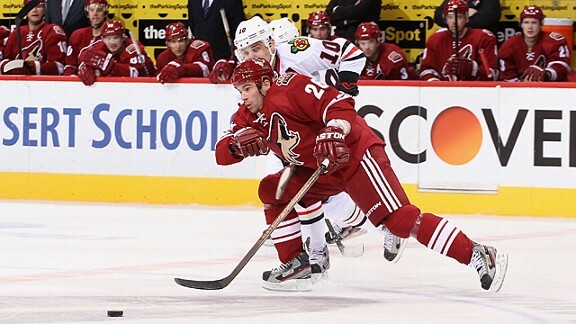 He is quite possibly the most skilled player in the entire league, and occasionally does stuff like this. 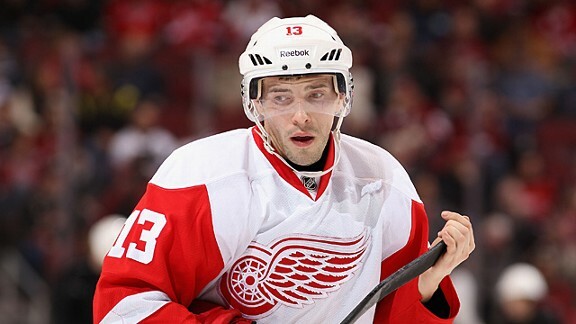 He may be even better defensively, having won the Selke Trophy as best defensive forward three times. Detroit chose him with the 171st overall pick of the 1998 draft, and I think we can all agree that we’re getting really sick of the Red Wings always doing stuff like that. 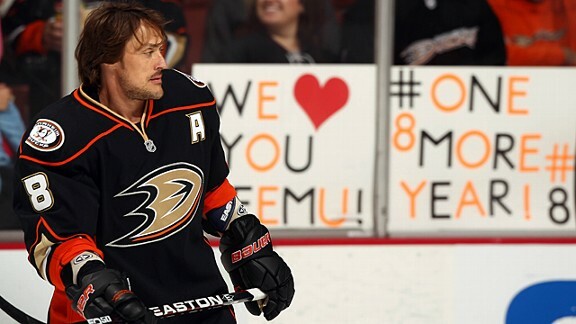 Selanne has more than 1,400 career points in the NHL, and is also the all-time leading scorer in the Winter Olympics. He’s been playing in the league for 20 years and is technically 42 years old, despite appearing to have stopped aging sometime around 1997. Before coming to North America, he spent three years working as a kindergarten teacher because, apparently, “professional puppy belly rubber” would’ve been overkill. 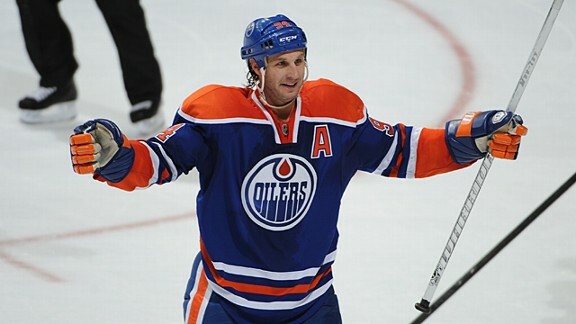 The prototypical Canadian power forward has scored 500 goals, all with the same team. He was one half of this infamous superstar-vs.-superstar fight in the 2004 Cup finals, which was pretty much the only thing anyone remembers from that series. His move out of Calgary was easily the most intriguing story of the 2013 trade deadline, and … oh, wait, I have to wait two months before I add this one. He agreed to appear in a series of Canadian bank commercials, yet never took the opportunity to pummel those two creepy dudes. He is occasionally featured in commercials that show footage of him as a little kid, which is especially cute because 20 years later, he looks exactly the same. He can basically handle any social situation by asking himself, “What would Patrick Kane do?” then do the opposite. Every once in a while, he drives his car into a lamppost for no good reason. He’s pretty much the perfect underdog story: an undrafted college player who struggles to stick in the NHL, spends years in the minors, gets released outright by two different teams, and then suddenly blossoms into a superstar who wins the scoring title, MVP award, and the Stanley Cup all in the same year. Did we mention he’s adorably wee? 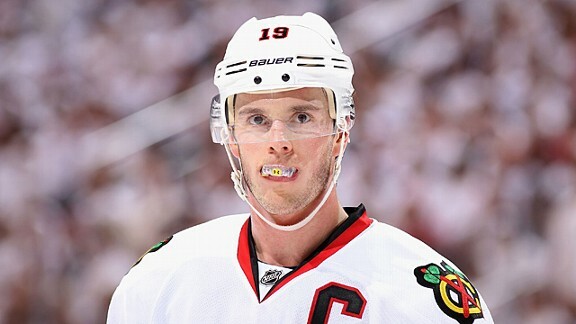 If you hit him in the mouth with a stick during the playoffs and knock out his teeth, he just gets a root canal between games and keeps playing. He’s a two-time Lady Byng Memorial Trophy winner, and nobody really likes anyone who wins the Lady Byng. He’s only in his second season, but apparently he’s incredibly mature. No, really, he is. Every article ever written about him mentions this fact, sometimes in every paragraph. He’s so mature that the Avalanche made him the youngest captain in league history last September when he was still a teenager. No, seriously, he’s super-mature, OK? Whenever the other Avalanche players start making too much noise playing video games, Gabriel Landeskog comes out in his bathrobe and knee-high socks and yells at them to go outside. He’s 20. Have you ever met even one 20-year-old in your life who wasn’t completely insufferable? OK, I’ll be honest. 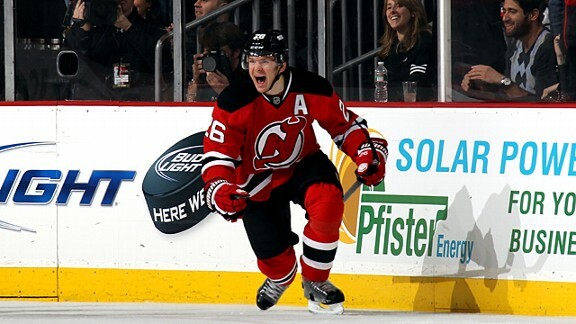 If you’re not a Devils fan, you don’t really know much about Patrik Elias. He’s just one of those guys who every fan is sort of vaguely aware they’re supposed to like, because otherwise Devils fans get upset, and have you ever had to spend time talking to one of those people? Remember when Scott Stevens kept hitting everyone in the head, and we all thought it was great until years later when we found out that concussions are really bad? Elias probably should’ve told him to stop doing that. OK, this one might be cheating a bit, since not every hockey fan loves him — just every Canadian hockey fan. And that’s only, what, 97 percent? 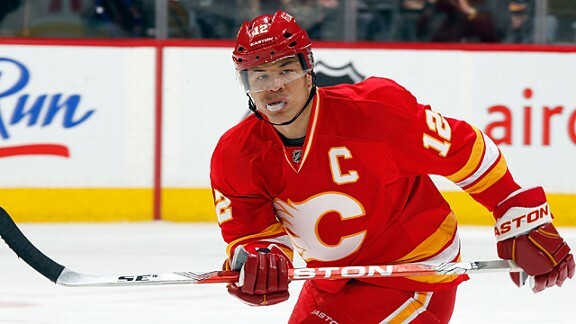 He’s earned the nickname “Captain Canada” because he’s played for Team Canada in basically every international tournament since 1994. If you’re ever in an arcade and see one of those old school Canada/Russia bubble hockey games, look closely: One of the Canadian players is a tiny Ryan Smyth. His hockey hair is pretty much the hockey-est hair that’s ever haired. In the 2011 offseason, he asked the L.A. Kings to trade him to the Oilers, so maybe don’t ask him for help with your lottery numbers. He’s essentially a poor man’s Martin St. Louis: an undersized afterthought who managed to defy the odds and have a lengthy NHL career. He has arguably the most improbable draft story ever — he wasn’t chosen until the 233rd pick of the 1994 NHL draft and yet somehow still managed to only be the fourth-best player taken in that round. This was probably the greatest thing that’s ever happened at a hockey game. If you mention his name near a Leafs fan, they’ll immediately launch into a lengthy tirade about how he’s an example of the team always getting rid of their young players instead of waiting for them to develop. This is also true of roughly 200 other players in the league, by the way. He was diagnosed with cancer prior to the 2011 2001 season and beat it. By “beat it,” I mean he made a surprise comeback at the end of that same season, leading Montreal to the final playoffs berth, followed by a first-round upset of their archrivals. He was the captain of the Habs even though he didn’t speak French, which is a pretty big problem, if you’re a moron. He’s an award-winning millionaire professional athlete living in New York. He looks like a model. In his spare time, he plays guitar in a rock band. Read those three points above. Seriously, how is it possible that we don’t all hate this guy already?